The use of cloud services within an organization is no longer an option, but a necessity for go-to-market speed, agility, scale and cost-savings. All too often, the business does not completely understand the risk of cloud usage. While the cloud promises scale and speed to propel your business, it also introduces threats and complexities you must consider. 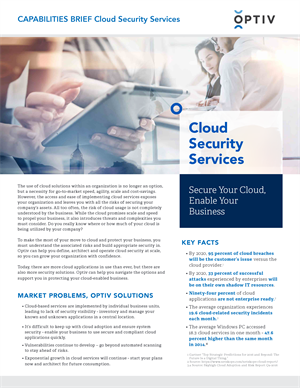 Learn how Optiv will help you plan, build and run cyber security solutions to protect your cloud-enabled business.